Definition at line 44 of file User.h. Definition at line 225 of file User.h. Definition at line 227 of file User.h. Definition at line 224 of file User.h. Definition at line 226 of file User.h. Definition at line 73 of file User.h. References allocHungoffUses(), assert(), getOperandList(), growHungoffUses(), llvm::Value::HasHungOffUses, N, llvm::Value::NumUserOperands, llvm::Value::NumUserOperandsBits, and ~User(). Definition at line 39 of file User.cpp. References assert(), llvm::Value::HasHungOffUses, and llvm::size(). Referenced by llvm::MemoryPhi::allocHungoffUses(), llvm::PHINode::allocHungoffUses(), llvm::SelectInst::areInvalidOperands(), llvm::LandingPadInst::Create(), llvm::CallBrInst::Create(), growHungoffUses(), llvm::PHINode::hasConstantOrUndefValue(), llvm::CmpInst::isImpliedFalseByMatchingCmp(), llvm::SwitchInst::removeCase(), and User(). Definition at line 306 of file User.h. This function is in charge of "letting go" of all objects that this User refers to. This allows one to 'delete' a whole class at a time, even though there may be circular references... First all references are dropped, and all use counts go to zero. Then everything is deleted for real. Note that no operations are valid on an object that has "dropped all references", except operator delete. Definition at line 294 of file User.h. References From, operands(), and replaceUsesOfWith(). Referenced by assertBranchOrSelectConditionHoisted(), llvm::deleteDeadLoop(), llvm::GlobalVariable::dropAllReferences(), llvm::BasicBlock::dropAllReferences(), llvm::Function::dropAllReferences(), llvm::slpvectorizer::BoUpSLP::VLOperands::dump(), llvm::expandDivision(), llvm::expandDivisionUpTo32Bits(), llvm::expandDivisionUpTo64Bits(), llvm::expandRemainder(), llvm::expandRemainderUpTo32Bits(), llvm::expandRemainderUpTo64Bits(), getNarrowIntrinsic(), getOrInsertValueProfilingCall(), isUnconditionalBranch(), okayForPHIOfOps(), llvm::MemorySSAUpdater::removeBlocks(), llvm::AMDGPULibCalls::useNative(), and llvm::MemorySSA::~MemorySSA(). Returns the descriptor co-allocated with this User instance. Definition at line 92 of file User.cpp. Definition at line 97 of file User.cpp. References assert(), llvm::Value::HasDescriptor, llvm::Value::HasHungOffUses, llvm::Value::NumUserOperandsBits, and Size. Definition at line 191 of file User.h. Referenced by llvm::SwitchInst::addCase(), llvm::LandingPadInst::addClause(), llvm::IndirectBrInst::addDestination(), llvm::CatchSwitchInst::addHandler(), llvm::PHINode::addIncoming(), AddReachableCodeToWorklist(), aliasSameBasePointerGEPs(), alwaysAvailable(), llvm::MemorySSAUpdater::applyInsertUpdates(), llvm::SelectInst::areInvalidOperands(), BatchCommitValueTo(), llvm::PHINode::block_end(), canReplaceGEPIdxWithZero(), canSinkInstructions(), canTransformAccumulatorRecursion(), canTrapImpl(), CC_MipsO32_FP64(), cloneConstantExprWithNewAddressSpace(), llvm::GetElementPtrInst::cloneImpl(), llvm::CallInst::cloneImpl(), llvm::FuncletPadInst::cloneImpl(), llvm::ReturnInst::cloneImpl(), llvm::BranchInst::cloneImpl(), llvm::InvokeInst::cloneImpl(), llvm::CallBrInst::cloneImpl(), llvm::CatchReturnInst::cloneImpl(), llvm::CleanupReturnInst::cloneImpl(), llvm::FunctionComparator::cmpConstants(), llvm::FunctionComparator::cmpOperations(), computeKnownBitsFromOperator(), computeUnsignedMinMaxValuesFromKnownBits(), llvm::ConstantExprKeyType::ConstantExprKeyType(), ConstantFold(), llvm::ConstantFoldLoadThroughGEPConstantExpr(), convert_i1_to_i8(), ConvertDoubleToBytes(), llvm::LandingPadInst::Create(), llvm::CallBrInst::Create(), llvm::CallInst::CreateFree(), llvm::createScalarizerPass(), llvm::createSeparateConstOffsetFromGEPPass(), DCEInstruction(), deleteDeadInstruction(), doPromotion(), llvm::GVNExpression::Expression::dump(), llvm::JumpThreadingPass::DuplicateCondBranchOnPHIIntoPred(), llvm::DuplicateInstructionsInSplitBetween(), eliminateRecursiveTailCall(), emitGlobalConstantArray(), emitGlobalConstantStruct(), emitSignedInt64(), llvm::AsmPrinter::EmitSpecialLLVMGlobal(), llvm::InstCombiner::eraseInstFromFunction(), EvaluateConstantChrecAtConstant(), EvaluateExpression(), llvm::Evaluator::EvaluateFunction(), evaluateGEPOffsetExpression(), evaluateICmpRelation(), EvaluateStoreInto(), llvm::VPInterleaveRecipe::execute(), llvm::VPWidenMemoryInstructionRecipe::execute(), ExposePointerBase(), llvm::FenceInst::FenceInst(), findUnwindDestinations(), FindUsedValues(), findUsedValues(), foldGuardedRotateToFunnelShift(), GEPSequentialConstIndexed(), GEPToVectorIndex(), getAllocationSize(), llvm::ConstantExpr::getAsInstruction(), llvm::PHINode::getBasicBlockIndex(), getComparePred(), llvm::getGEPInductionOperand(), getGEPSmallConstantIntOffsetV(), getInductionVariable(), llvm::SCEVExpander::getIVIncOperand(), llvm::InvokeInst::getLandingPadInst(), getLoopPhiForCounter(), llvm::SystemZTTIImpl::getMemoryOpCost(), getMetadataTypeOrder(), getNarrowIntrinsic(), getNoopInput(), llvm::SwitchInst::getNumCases(), llvm::LandingPadInst::getNumClauses(), llvm::IndirectBrInst::getNumDestinations(), llvm::CatchSwitchInst::getNumHandlers(), llvm::PHINode::getNumIncomingValues(), llvm::GEPOperator::getNumIndices(), llvm::GetElementPtrInst::getNumIndices(), llvm::SwitchInst::getNumSuccessors(), llvm::IndirectBrInst::getNumSuccessors(), llvm::CatchSwitchInst::getNumSuccessors(), GetOffsetFromIndex(), getOffsetFromIndices(), getOrInsertValueProfilingCall(), getParentPad(), getPointerOperands(), getRangeForAffineARHelper(), llvm::ReturnInst::getReturnValue(), getScalarIntrinsicDeclaration(), getSelectFoldableConstant(), llvm::ConstantVector::getSplatValue(), getSuccPad(), llvm::X86TTIImpl::getUserCost(), llvm::TargetTransformInfoImplCRTPBase< AMDGPUTTIImpl >::getUserCost(), llvm::DbgVariableIntrinsic::getVariableLocation(), llvm::ConstantExpr::getWithOperandReplaced(), llvm::ConstantExpr::getWithOperands(), growHungoffUses(), llvm::Constant::handleOperandChange(), llvm::GetElementPtrInst::hasAllConstantIndices(), llvm::GetElementPtrInst::hasAllZeroIndices(), llvm::PHINode::hasConstantOrUndefValue(), llvm::GEPOperator::hasIndices(), llvm::GetElementPtrInst::hasIndices(), hasOnlyOneNonZeroIndex(), INITIALIZE_PASS(), llvm::isBytewiseValue(), llvm::ShuffleVectorInst::isConcat(), llvm::BranchInst::isConditional(), isEmptyXXStructor(), llvm::isGEPBasedOnPointerToString(), isGEPFoldable(), llvm::Instruction::isIdenticalToWhenDefined(), isIgnorableInst(), llvm::CmpInst::isImpliedFalseByMatchingCmp(), isOnlyReachableViaThisEdge(), IsPointerOffset(), isPromotedInstructionLegal(), IsSafeComputationToRemove(), isSafeSROAGEP(), llvm::isSafeToSpeculativelyExecute(), llvm::Instruction::isSameOperationAs(), isSExtLoad(), isSimpleEnoughValueToCommitHelper(), llvm::BranchInst::isUnconditional(), matchesOr(), llvm::gvn::AvailableValueInBlock::MaterializeAdjustedValue(), maybePrintCallAddrSpace(), mergeEmptyReturnBlocks(), moveUp(), llvm::Constant::needsRelocation(), okayForPHIOfOps(), llvm::HungoffOperandTraits< 3 >::op_end(), llvm::OptionalOperandTraits< GlobalVariable >::operands(), llvm::VariadicOperandTraits< ConstantExpr, 1 >::operands(), llvm::HungoffOperandTraits< 3 >::operands(), llvm::orc::CtorDtorIterator::operator*(), operator<<(), llvm::ConstantExprKeyType::operator==(), orderValue(), parseGlobalCtors(), llvm::CallBase::populateBundleOperandInfos(), predictValueUseListOrder(), llvm::VPBlendRecipe::print(), propagateMetadata(), llvm::remapInstruction(), llvm::SwitchInst::removeCase(), llvm::IndirectBrInst::removeDestination(), removeGlobalCtors(), llvm::CatchSwitchInst::removeHandler(), llvm::PHINode::removeIncomingValue(), RemoveInstInputs(), replaceAllUsesOfWithIn(), llvm::VPValue::replaceAllUsesWith(), llvm::ConstantUniqueMap< llvm::ConstantExpr >::replaceOperandsInPlace(), replaceUsesOfWith(), ReplaceUsesOfWith(), llvm::returnTypeIsEligibleForTailCall(), llvm::WholeProgramDevirtPass::run(), llvm::InstCombiner::run(), llvm::ExecutionEngine::runStaticConstructorsDestructors(), llvm::InnerLoopVectorizer::scalarizeInstruction(), ShrinkDemandedConstant(), simplifyAndDCEInstruction(), sinkLastInstruction(), SRAGlobal(), llvm::stripGetElementPtr(), llvm::JumpThreadingPass::ThreadEdge(), transformToIndexedCompare(), llvm::UnreachableInst::UnreachableInst(), ValueIsOnlyUsedLocallyOrStoredToOneGlobal(), VerifySubExpr(), llvm::LoopVersioning::versionLoop(), llvm::InstCombiner::visitGetElementPtrInst(), VisitGlobalVariableForEmission(), llvm::Interpreter::visitReturnInst(), llvm::InstCombiner::visitReturnInst(), and llvm::InnerLoopVectorizer::widenPHIInstruction(). Definition at line 169 of file User.h. References assert(), getOperandList(), and llvm::Value::NumUserOperands. Referenced by AddReachableCodeToWorklist(), addStackMapLiveVars(), aliasSameBasePointerGEPs(), alwaysAvailable(), areExtractExts(), areInverseVectorBitmasks(), llvm::AtomicCmpXchgInst::AtomicCmpXchgInst(), BatchCommitValueTo(), llvm::BinaryOperator::BinaryOperator(), BreakUpSubtract(), buildMultiplyTree(), canEvaluateShifted(), canEvaluateShiftedShift(), canEvaluateShuffled(), canFoldIVIncExpr(), llvm::slpvectorizer::BoUpSLP::canMapToVector(), canNarrowShiftAmt(), cannotBeOrderedLessThanZeroImpl(), canonicalizeBitCastExtElt(), canonicalizeCmpWithConstant(), canonicalizeICmpBool(), canonicalizeSaturatedAdd(), canonicalizeSaturatedSubtract(), CanPHITrans(), CanProveNotTakenFirstIteration(), canReplaceGEPIdxWithZero(), llvm::canReplaceOperandWithVariable(), canSinkInstructions(), canTransformAccumulatorRecursion(), castRequiresQueuePtr(), CC_MipsO32_FP64(), cheapToScalarize(), checkForNegativeOperand(), CleanupPointerRootUsers(), cloneConstantExprWithNewAddressSpace(), llvm::AllocaInst::cloneImpl(), llvm::LoadInst::cloneImpl(), llvm::StoreInst::cloneImpl(), llvm::AtomicCmpXchgInst::cloneImpl(), llvm::AtomicRMWInst::cloneImpl(), llvm::SelectInst::cloneImpl(), llvm::VAArgInst::cloneImpl(), llvm::ExtractElementInst::cloneImpl(), llvm::InsertElementInst::cloneImpl(), llvm::ShuffleVectorInst::cloneImpl(), llvm::TruncInst::cloneImpl(), llvm::ZExtInst::cloneImpl(), llvm::SExtInst::cloneImpl(), llvm::FPTruncInst::cloneImpl(), llvm::FPExtInst::cloneImpl(), llvm::UIToFPInst::cloneImpl(), llvm::SIToFPInst::cloneImpl(), llvm::FPToUIInst::cloneImpl(), llvm::FPToSIInst::cloneImpl(), llvm::IntToPtrInst::cloneImpl(), llvm::PtrToIntInst::cloneImpl(), llvm::BitCastInst::cloneImpl(), llvm::AddrSpaceCastInst::cloneImpl(), cloneInstructionWithNewAddressSpace(), llvm::FunctionComparator::cmpConstants(), llvm::FunctionComparator::cmpOperations(), llvm::collectCmpOps(), collectInsertionElements(), collectShuffleElements(), collectSingleShuffleElements(), llvm::LoopVectorizationPlanner::collectTriviallyDeadInstructions(), collectValuesToDemote(), combineADDToADDZE(), CommitValueTo(), llvm::InstCombiner::commonCastTransforms(), llvm::InstCombiner::commonIDivTransforms(), llvm::InstCombiner::commonIRemTransforms(), llvm::InstCombiner::commonPointerCastTransforms(), llvm::InstCombiner::commonShiftTransforms(), computeBytesPoppedByCalleeForSRet(), computeKnownBitsFromOperator(), computeKnownBitsFromShiftOperator(), llvm::ComputeMultiple(), ComputeNumSignBitsImpl(), llvm::computeOverflowForSignedAdd(), computeUnlikelySuccessors(), computeUnsignedMinMaxValuesFromKnownBits(), llvm::JumpThreadingPass::ComputeValueKnownInPredecessorsImpl(), llvm::ConstantExprKeyType::ConstantExprKeyType(), ConstantFold(), llvm::ConstantFoldCompareInstOperands(), llvm::ConstantFoldCompareInstruction(), llvm::ConstantFoldLoadFromConstPtr(), llvm::ConstantFoldLoadThroughBitcast(), llvm::ConstantFoldLoadThroughGEPConstantExpr(), llvm::ConstantFoldSelectInstruction(), constantFoldUser(), convert_i1_to_i8(), ConvertDoubleToBytes(), ConvertShiftToMul(), ConvertToSInt(), llvm::UnaryOperator::Create(), llvm::createConstantHoistingPass(), llvm::createDwarfEHPass(), createFFSIntrinsic(), createRdxShuffleMask(), createReplacementInstr(), llvm::createScalarizerPass(), llvm::createSeparateConstOffsetFromGEPPass(), DCEInstruction(), decomposeSimpleLinearExpr(), deleteDeadInstruction(), despeculateCountZeros(), detectPopcountIdiom(), detectShiftUntilZeroIdiom(), llvm::GVNExpression::Expression::dump(), llvm::JumpThreadingPass::DuplicateCondBranchOnPHIIntoPred(), llvm::DuplicateInstructionsInSplitBetween(), eliminateRecursiveTailCall(), emitGlobalConstantArray(), emitGlobalConstantStruct(), emitGlobalConstantVector(), emitSignedInt64(), llvm::AsmPrinter::EmitSpecialLLVMGlobal(), EqualityPropUnSafe(), EvaluateConstantChrecAtConstant(), EvaluateExpression(), llvm::Evaluator::EvaluateFunction(), evaluateGEPOffsetExpression(), evaluateICmpRelation(), EvaluateStoreInto(), llvm::VPBlendRecipe::execute(), llvm::VPInterleaveRecipe::execute(), llvm::VPBranchOnMaskRecipe::execute(), llvm::VPPredInstPHIRecipe::execute(), llvm::VPWidenMemoryInstructionRecipe::execute(), ExpandBinOp(), llvm::expandDivision(), llvm::expandDivisionUpTo32Bits(), llvm::expandDivisionUpTo64Bits(), llvm::expandRemainder(), llvm::expandRemainderUpTo32Bits(), llvm::expandRemainderUpTo64Bits(), ExposePointerBase(), llvm::AlignmentFromAssumptionsPass::extractAlignmentInfo(), ExtractConstantBytes(), ExtractEquivalentCondition(), factorizeFAddFSub(), FindAllMemoryUses(), findBuildVector(), findGlobalCtors(), findInitTrampoline(), findInitTrampolineFromAlloca(), findInitTrampolineFromBB(), findMatchingInlineAsmOperand(), llvm::SelectionDAGBuilder::FindMergedConditions(), FindPredecessorAutoreleaseWithSafePath(), FindSingleUseMultiplyFactors(), findStoreAlignment(), findUnwindDestinations(), FindUsedValues(), findUsedValues(), FixedPointIntrinsicToOpcode(), foldAndOrOfEqualityCmpsWithConstants(), foldAndToXor(), foldBitCastBitwiseLogic(), foldBitCastSelect(), llvm::FoldBranchToCommonDest(), foldConstantCastPair(), foldConstantInsEltIntoShuffle(), foldFabsWithFcmpZero(), foldFCmpReciprocalAndZero(), foldFDivConstantDividend(), foldFDivConstantDivisor(), foldGuardedRotateToFunnelShift(), foldICmpBitCast(), foldICmpShlOne(), foldICmpWithHighBitMask(), foldICmpWithLowBitMaskedVal(), foldICmpWithMinMax(), foldICmpWithTruncSignExtendedVal(), foldIdentityExtractShuffle(), foldInsSequenceIntoBroadcast(), llvm::InstCombiner::FoldItoFPtoI(), foldLogicCastConstant(), foldNoWrapAdd(), foldOperationIntoPhiValue(), foldOperationIntoSelectOperand(), foldOrToXor(), foldSelectBinOpIdentity(), foldSelectICmpAnd(), foldSelectICmpAndAnd(), foldSelectICmpAndOr(), foldSelectInst(), foldSelectShuffle(), foldSelectShuffleWith1Binop(), llvm::InstCombiner::FoldShiftByConstant(), foldShiftedShift(), foldShuffleWithInsert(), foldSignedTruncationCheck(), foldVectorCmp(), foldVecTruncToExtElt(), foldXorToXor(), llvm::ScalarEvolution::forgetValue(), GEPSequentialConstIndexed(), GEPToVectorIndex(), llvm::IndirectBrInst::getAddress(), llvm::ExtractValueInst::getAggregateOperand(), llvm::InsertValueInst::getAggregateOperand(), getAlternateBinop(), llvm::IRTranslator::getAnalysisUsage(), llvm::AllocaInst::getArraySize(), getAsConstantIndexedAddress(), getBinOpsForFactorization(), getBranchCondString(), llvm::SystemZTTIImpl::getCastInstrCost(), llvm::AArch64TTIImpl::getCastInstrCost(), getCastsForInductionPHI(), getChainID(), getCmpOpsType(), llvm::SystemZTTIImpl::getCmpSelInstrCost(), getCommonReturnValue(), getCompareCC(), llvm::AtomicCmpXchgInst::getCompareOperand(), getComparePred(), llvm::SwitchInst::getCondition(), getConstantAt(), GetConstantInt(), llvm::SwitchInst::getDefaultDest(), getDemandedBitsLHSMask(), getExtractIndex(), llvm::getGEPInductionOperand(), getGEPSmallConstantIntOffsetV(), llvm::getGuaranteedNonFullPoisonOp(), llvm::PHINode::getIncomingValue(), llvm::CallBrInst::getIndirectDestLabel(), llvm::GlobalIndirectSymbol::getIndirectSymbol(), getInductionVariable(), llvm::InsertValueInst::getInsertedValueOperand(), llvm::SCEVExpander::getIVIncOperand(), GetLoopInvariantInsertPosition(), getLoopPhiForCounter(), llvm::ShuffleVectorInst::getMask(), getMaskedTypeForICmpPair(), getMaxPointerSize(), llvm::SystemZTTIImpl::getMemoryOpCost(), getMulHu(), getNarrowIntrinsic(), llvm::AtomicCmpXchgInst::getNewValOperand(), llvm::DOTGraphTraits< BoUpSLP * >::getNodeAttributes(), getNoopInput(), GetOffsetFromIndex(), getOffsetFromIndices(), getOrInsertValueProfilingCall(), getParameterABIAttributes(), getParentPad(), llvm::CatchSwitchInst::getParentPad(), llvm::LoadInst::getPointerOperand(), llvm::StoreInst::getPointerOperand(), llvm::GEPOperator::getPointerOperand(), llvm::PtrToIntOperator::getPointerOperand(), llvm::AtomicCmpXchgInst::getPointerOperand(), llvm::AtomicRMWInst::getPointerOperand(), llvm::GetElementPtrInst::getPointerOperand(), llvm::VAArgInst::getPointerOperand(), llvm::PtrToIntInst::getPointerOperand(), llvm::AddrSpaceCastInst::getPointerOperand(), getPointerOperands(), getRangeForAffineARHelper(), getRecurrenceVar(), getReducedType(), getRelevantOperands(), llvm::objcarc::getreturnRVOperand(), llvm::ReturnInst::getReturnValue(), getScalarIntrinsicDeclaration(), getSelectFoldableConstant(), getShiftedValue(), llvm::getSplatValue(), llvm::ConstantVector::getSplatValue(), getSqrtCall(), llvm::BitCastOperator::getSrcTy(), llvm::getStrideFromPointer(), llvm::SwitchInst::getSuccessor(), llvm::IndirectBrInst::getSuccessor(), llvm::CatchSwitchInst::getSuccessor(), getSuccPad(), llvm::BasicBlock::getTerminatingMustTailCall(), llvm::HexagonTargetLowering::getTgtMemIntrinsic(), llvm::SITargetLowering::getTgtMemIntrinsic(), llvm::CatchSwitchInst::getUnwindDest(), llvm::X86TTIImpl::getUserCost(), llvm::TargetTransformInfoImplCRTPBase< AMDGPUTTIImpl >::getUserCost(), llvm::AtomicRMWInst::getValOperand(), getValueFromConditionImpl(), getValueFromICmpCondition(), llvm::StoreInst::getValueOperand(), llvm::ConstantExpr::getWithOperandReplaced(), llvm::ConstantExpr::getWithOperands(), GlobalWasGeneratedByCompiler(), handleBrSelExpect(), handleFree(), handleIndirectSymViaGOTPCRel(), llvm::Constant::handleOperandChange(), handlePhiDef(), llvm::GetElementPtrInst::hasAllConstantIndices(), llvm::GetElementPtrInst::hasAllZeroIndices(), hasOnlyOneNonZeroIndex(), hasOnlySelectUsers(), hasSameExtUse(), hasStoreUsersOnly(), hasUndefContents(), hasValueBeenRAUWed(), hasZeroSignBit(), hoistInsEltConst(), llvm::SCEVExpander::hoistIVInc(), llvm::hoistRegion(), INITIALIZE_PASS(), llvm::InlineFunction(), instrumentMaskedLoadOrStore(), inversePermutation(), isAddOfNonZero(), llvm::isAllocaPromotable(), isAllocSiteRemovable(), isAlwaysFoldable(), isAlwaysLive(), llvm::AllocaInst::isArrayAllocation(), isBroadcastShuffle(), llvm::isBytewiseValue(), isCallPromotable(), isChainSelectCmpBranch(), llvm::ShuffleVectorInst::isConcat(), isCondRelevantToAnyCallArgument(), isContiguous(), llvm::TargetLoweringBase::isExtFree(), isExtractBitsCandidateUse(), llvm::SystemZTTIImpl::isFoldableLoad(), llvm::InductionDescriptor::isFPInductionPHI(), isFuncOrArgAttr(), llvm::isGEPBasedOnPointerToString(), isGEPFoldable(), isGOTEquivalentCandidate(), isIgnorableInst(), isImpliedCondICmps(), llvm::CastInst::isIntegerCast(), isInterestingPointerComparison(), isInterestingPointerSubtraction(), isIntExtFree(), isLoadInvariantInLoop(), isLoopInvariant(), llvm::CastInst::isLosslessCast(), llvm::AArch64TargetLowering::isMaskAndCmp0FoldingBeneficial(), llvm::RecurrenceDescriptor::isMinMaxSelectCmpPattern(), isMulPowOf2(), llvm::CastInst::isNoopCast(), isObjectDereferencedInBlock(), isOnlyReachableViaThisEdge(), IsPointerOffset(), isProfitableToFoldUnconditional(), llvm::AArch64TargetLowering::isProfitableToHoist(), isPromotedInstructionLegal(), isReassociableOp(), isReInterleaveMask(), isRepeatedByteSequence(), isReportingError(), isReturnNonNull(), isSafeAndProfitableToSinkLoad(), IsSafeComputationToRemove(), isSafeSROAGEP(), isSafeToEliminateVarargsCast(), llvm::isSafeToSpeculativelyExecute(), isSameCompare(), llvm::Instruction::isSameOperationAs(), isSExtLoad(), isShuffleEquivalentToSelect(), isShuffleExtractingFromLHS(), isSimpleEnoughValueToCommitHelper(), isSink(), llvm::AllocaInst::isStaticAlloca(), isStrideMul(), isVectorReductionOp(), isZero(), llvm::AArch64TargetLowering::isZExtFree(), LdStHasDebugValue(), LinearizeExprTree(), lookThroughCast(), llvm::FastISel::lowerCallTo(), llvm::AsmPrinter::lowerConstant(), llvm::AArch64TargetLowering::lowerInterleavedStore(), llvm::ARMTargetLowering::lowerInterleavedStore(), llvm::IntrinsicLowering::LowerIntrinsicCall(), LowerNegateToMultiply(), llvm::LTOModule::makeBuffer(), mapBinOpcode(), matchCondition(), matchDeMorgansLaws(), matchesOr(), matchPairwiseReduction(), matchPairwiseReductionAtLevel(), MatchParallelMACSequences(), matchRotate(), llvm::matchSelectPattern(), matchSelectWithOptionalNotCond(), matchUAddWithOverflowConstantEdgeCases(), matchVectorSplittingReduction(), maybePrintCallAddrSpace(), mayDivideByZero(), mayUsePostIncMode(), llvm::LoopVectorizationCostModel::memoryInstructionCanBeWidened(), mergeCleanupPad(), mergeEmptyReturnBlocks(), MightBeFoldableInst(), moveUp(), MulWillOverflow(), narrowUDivURem(), narrowVectorSelect(), needsLFTR(), llvm::Constant::needsRelocation(), NegateValue(), llvm::orc::CtorDtorIterator::operator*(), operator<<(), llvm::ConstantExprKeyType::operator==(), OptimizeAwayTrappingUsesOfLoads(), llvm::FastISel::optimizeCmpPredicate(), optimizeDivRem(), OptimizeExtractBits(), llvm::slpvectorizer::BoUpSLP::optimizeGatherSequence(), optimizeIntegerToVectorInsertions(), OptimizeNoopCopyExpression(), optimizeSQRT(), parseGlobalCtors(), false::LibCallsShrinkWrap::perform(), PerformHeapAllocSRoA(), PickMostRelevantLoop(), llvm::PointerMayBeCaptured(), llvm::SelectionDAGBuilder::populateCallLoweringInfo(), llvm::VPBlendRecipe::print(), llvm::VPInterleaveRecipe::print(), llvm::VPWidenMemoryInstructionRecipe::print(), processAShr(), processBinOp(), llvm::JumpThreadingPass::ProcessBranchOnXOR(), processCmp(), processSDiv(), processSelect(), processSRem(), processUDivOrURem(), processUGT_ADDCST_ADD(), processUMulZExtIdiom(), promotedOpIsNUW(), llvm::promoteLoopAccessesToScalars(), propagateMetadata(), PushDefUseChildren(), reassociateFCmps(), llvm::remapInstruction(), llvm::safestack::StackColoring::removeAllMarkers(), removeGlobalCtors(), RemoveInstInputs(), replaceAllUsesOfWithIn(), llvm::VPValue::replaceAllUsesWith(), llvm::replaceCreatedSSACopys(), llvm::InstCombiner::replacedSelectWithOperand(), replaceExtractElements(), replaceUsesOfWith(), ReplaceUsesOfWith(), reportLoadElim(), llvm::returnTypeIsEligibleForTailCall(), reuseTableCompare(), rewriteSingleStoreAlloca(), llvm::LoopPredicationPass::run(), llvm::WholeProgramDevirtPass::run(), llvm::InstCombiner::run(), llvm::ExecutionEngine::runStaticConstructorsDestructors(), llvm::salvageDebugInfoForDbgValues(), llvm::salvageDebugInfoImpl(), llvm::SelectionDAGBuilder::salvageUnresolvedDbgValue(), scalarizeBinOpOfBuildVectors(), llvm::InnerLoopVectorizer::scalarizeInstruction(), llvm::FastISel::selectBinaryOp(), llvm::FastISel::selectBitCast(), llvm::FastISel::selectCast(), llvm::FastISel::selectExtractValue(), llvm::FastISel::selectGetElementPtr(), llvm::FastISel::selectOperator(), llvm::FastISel::selectPatchpoint(), llvm::FastISel::selectStackmap(), llvm::LoadInst::setAlignment(), llvm::StoreInst::setAlignment(), llvm::LoopVectorizationCostModel::setCostBasedWideningDecision(), setLimitsForBinOp(), setLimitsForIntrinsic(), ShouldBreakUpSubtract(), shouldKeepFDivF32(), shouldMergeGEPs(), llvm::AArch64TargetLowering::shouldSinkOperands(), llvm::ARMTargetLowering::shouldSinkOperands(), ShrinkDemandedConstant(), shrinkInsertElt(), shrinkSplatShuffle(), simplifyAndDCEInstruction(), simplifyAndOfICmpsWithAdd(), simplifyAndOrOfFCmps(), simplifyAndOrOfICmpsWithConstants(), simplifyAndOrOfICmpsWithZero(), simplifyAssocCastAssoc(), SimplifyAssociativeBinOp(), SimplifyBSwap(), llvm::InstCombiner::simplifyDivRemOfSelectWithZeroOp(), SimplifyICmpInst(), simplifyICmpWithBinOp(), SimplifyIndirectBrOnSelect(), llvm::SimplifyInstruction(), simplifyMaskedGather(), simplifyMaskedLoad(), simplifyOrOfICmpsWithAdd(), llvm::JumpThreadingPass::SimplifyPartiallyRedundantLoad(), llvm::InstCombiner::simplifyRangeCheck(), SimplifyRelativeLoad(), simplifyValueKnownNonZero(), SimplifyWithOpReplaced(), simplifyX86MaskedLoad(), simplifyX86MaskedStore(), sinkAndCmp0Expression(), SinkCast(), sinkCmpExpression(), sinkLastInstruction(), SinkShiftAndTruncate(), AllocaSlices::SliceBuilder::SliceBuilder(), llvm::InstCombiner::SliceUpIllegalIntegerPHI(), splitMergedValStore(), SRAGlobal(), llvm::stripGetElementPtr(), supportedAddressingMode(), ThreadBinOpOverSelect(), llvm::JumpThreadingPass::ThreadEdge(), transformToIndexedCompare(), truncateIVUse(), llvm::InnerLoopVectorizer::truncateToMinimalBitwidths(), TryToMergeLandingPad(), llvm::VPRecipeBuilder::tryToOptimizeInduction(), TryToShrinkGlobalToBoolean(), llvm::JumpThreadingPass::TryToUnfoldSelect(), tryToVectorizeHorReductionOrInstOperands(), tryUnmergingGEPsAcrossIndirectBr(), TypeSizeToSizeIndex(), llvm::InnerLoopVectorizer::updateAnalysis(), updateOperand(), llvm::SelectionDAGBuilder::UpdateSplitBlock(), UpgradeX86AddSubSatIntrinsics(), upgradeX86ConcatShift(), upgradeX86Rotate(), VerifySubExpr(), llvm::sroa::AllocaSliceRewriter::visit(), llvm::InstCombiner::visitAdd(), llvm::InstCombiner::visitAddrSpaceCast(), llvm::Interpreter::visitAllocaInst(), llvm::InstCombiner::visitAnd(), llvm::Interpreter::visitAShr(), llvm::InstCombiner::visitAShr(), llvm::Interpreter::visitBinaryOperator(), llvm::InstCombiner::visitBitCast(), llvm::Interpreter::visitBitCastInst(), llvm::Interpreter::visitExtractElementInst(), llvm::InstCombiner::visitExtractElementInst(), llvm::InstCombiner::visitFAdd(), llvm::Interpreter::visitFCmpInst(), llvm::InstCombiner::visitFCmpInst(), llvm::InstCombiner::visitFDiv(), llvm::InstCombiner::visitFMul(), llvm::Interpreter::visitFPExtInst(), llvm::InstCombiner::visitFPToSI(), llvm::Interpreter::visitFPToSIInst(), llvm::InstCombiner::visitFPToUI(), llvm::Interpreter::visitFPToUIInst(), llvm::InstCombiner::visitFPTrunc(), llvm::Interpreter::visitFPTruncInst(), llvm::InstCombiner::visitFRem(), llvm::InstCombiner::visitFSub(), llvm::InstCombiner::visitGetElementPtrInst(), VisitGlobalVariableForEmission(), llvm::Interpreter::visitICmpInst(), llvm::InstCombiner::visitICmpInst(), llvm::Interpreter::visitInsertElementInst(), llvm::InstCombiner::visitInsertElementInst(), llvm::Interpreter::visitInsertValueInst(), llvm::InstCombiner::visitInsertValueInst(), llvm::InstCombiner::visitIntToPtr(), llvm::Interpreter::visitIntToPtrInst(), visitIVCast(), llvm::InstCombiner::visitLandingPadInst(), llvm::InstCombiner::visitLoadInst(), llvm::Interpreter::visitLShr(), llvm::InstCombiner::visitLShr(), llvm::InstCombiner::visitMul(), llvm::InstCombiner::visitOr(), llvm::InstCombiner::visitPHINode(), llvm::InstCombiner::visitPtrToInt(), llvm::Interpreter::visitPtrToIntInst(), llvm::InstCombiner::visitReturnInst(), llvm::InstCombiner::visitSDiv(), llvm::Interpreter::visitSelectInst(), llvm::InstCombiner::visitSExt(), llvm::Interpreter::visitSExtInst(), llvm::Interpreter::visitShl(), llvm::InstCombiner::visitShl(), llvm::Interpreter::visitShuffleVectorInst(), llvm::InstCombiner::visitShuffleVectorInst(), llvm::Interpreter::visitSIToFPInst(), llvm::InstCombiner::visitSRem(), llvm::Interpreter::visitStoreInst(), llvm::InstCombiner::visitStoreInst(), llvm::InstCombiner::visitSub(), llvm::InstCombiner::visitTrunc(), llvm::Interpreter::visitTruncInst(), llvm::InstCombiner::visitUDiv(), llvm::Interpreter::visitUIToFPInst(), llvm::InstCombiner::visitURem(), llvm::Interpreter::visitVAArgInst(), llvm::InstCombiner::visitXor(), llvm::InstCombiner::visitZExt(), llvm::Interpreter::visitZExtInst(), llvm::InnerLoopVectorizer::widenInstruction(), X86ChooseCmpImmediateOpcode(), and llvm::reassociate::XorOpnd::XorOpnd(). Definition at line 162 of file User.h. Referenced by llvm::LandingPadInst::addClause(), llvm::IndirectBrInst::addDestination(), llvm::CatchSwitchInst::addHandler(), llvm::CallBrInst::Create(), llvm::LandingPadInst::getClause(), llvm::ConstantExpr::getOpcodeName(), getOperand(), getOperandList(), getOperandUse(), growHungoffUses(), llvm::Constant::handleOperandChange(), llvm::PHINode::hasConstantOrUndefValue(), llvm::LandingPadInst::isCatch(), llvm::LandingPadInst::isFilter(), llvm::CmpInst::isImpliedFalseByMatchingCmp(), llvm::HungoffOperandTraits< 3 >::op_begin(), op_begin(), llvm::HungoffOperandTraits< 3 >::op_end(), op_end(), llvm::SwitchInst::removeCase(), llvm::IndirectBrInst::removeDestination(), setOperand(), and User(). Definition at line 165 of file User.h. Definition at line 182 of file User.h. Referenced by BrPHIToSelect(), llvm::GVNExpression::Expression::dump(), llvm::formLCSSAForInstructions(), llvm::CallBase::getArgOperandUse(), llvm::CallBrInst::getIndirectDestLabelUse(), getParentPad(), getTypePartition(), shouldFixMainFunction(), llvm::AArch64TargetLowering::shouldSinkOperands(), llvm::ARMTargetLowering::shouldSinkOperands(), ShrinkDemandedConstant(), and sinkLastInstruction(). Definition at line 186 of file User.h. Grow the number of hung off uses. Note that allocHungoffUses should be called if there are no uses. Definition at line 58 of file User.cpp. References allocHungoffUses(), assert(), llvm::copy(), getNumOperands(), getOperandList(), llvm::Value::HasHungOffUses, and llvm::Use::zap(). 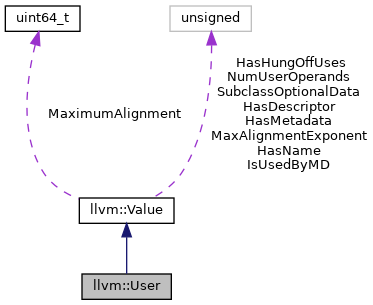 Referenced by llvm::LandingPadInst::Create(), llvm::CallBrInst::Create(), llvm::SwitchInst::removeCase(), llvm::PHINode::removeIncomingValue(), and User(). Definition at line 133 of file User.h. Referenced by canTrapImpl(), ConstHasGlobalValuePredicate(), llvm::CallBrInst::Create(), llvm::CatchPadInst::getCatchSwitch(), llvm::BranchInst::getCondition(), llvm::CallBrInst::getDefaultDest(), llvm::CallBrInst::getIndirectDest(), llvm::ConstantExpr::getOpcode(), llvm::AtomicRMWInst::getOperation(), llvm::BranchInst::getSuccessor(), llvm::DbgVariableIntrinsic::getVariableLocation(), llvm::ConstantExpr::getWithOperandReplaced(), llvm::Constant::handleOperandChange(), llvm::ShuffleVectorInst::isValidOperands(), llvm::CatchSwitchInst::removeHandler(), llvm::PHINode::removeIncomingValue(), llvm::CatchPadInst::setCatchSwitch(), llvm::BranchInst::setCondition(), llvm::CallBrInst::setDefaultDest(), llvm::CallBrInst::setIndirectDest(), llvm::BranchInst::setSuccessor(), llvm::CallBrInst::setSuccessor(), llvm::BranchInst::swapSuccessors(), and llvm::UnreachableInst::UnreachableInst(). Definition at line 136 of file User.h. References assert(), llvm::Value::HasHungOffUses, and llvm::Value::NumUserOperands. Definition at line 229 of file User.h. Referenced by alwaysAvailable(), llvm::RecurrenceDescriptor::areAllUsesIn(), llvm::SelectInst::areInvalidOperands(), llvm::PHINode::block_begin(), buildMultiplyTree(), llvm::objcarc::CanUse(), CC_MipsO32_FP64(), CloneInstructionInExitBlock(), llvm::ConstantAggregate::ConstantAggregate(), llvm::ConstantFoldLoadFromConstPtr(), llvm::CallInst::CreateFree(), createReplacementInstr(), llvm::createSeparateConstOffsetFromGEPPass(), DominatesMergePoint(), doPromotion(), llvm::EmitGEPOffset(), ExposePointerBase(), llvm::FenceInst::FenceInst(), FoldCondBranchOnPHI(), llvm::FoldReturnIntoUncondBranch(), llvm::gep_type_begin(), llvm::ConstantExpr::getAsInstruction(), getComparePred(), getDebugLocFromInstOrOperands(), llvm::PHINode::getIncomingBlock(), llvm::SCEVExpander::getIVIncOperand(), llvm::InvokeInst::getLandingPadInst(), getMaxPointerSize(), getMetadataTypeOrder(), llvm::DOTGraphTraits< BoUpSLP * >::getNodeAttributes(), llvm::Use::getOperandNo(), llvm::SelectionDAGBuilder::getValueImpl(), llvm::ConstantExpr::getWithOperands(), llvm::CatchSwitchInst::handler_begin(), llvm::RecurrenceDescriptor::hasMultipleUsesOf(), hasUsesOutsideLoop(), llvm::GEPOperator::idx_begin(), llvm::GetElementPtrInst::idx_begin(), INITIALIZE_PASS(), llvm::ConstantExpr::isGEPWithNoNotionalOverIndexing(), llvm::Instruction::isIdenticalToWhenDefined(), llvm::SelectionDAGBuilder::LowerCallSiteWithDeoptBundleImpl(), llvm::gvn::AvailableValueInBlock::MaterializeAdjustedValue(), mayLoopAccessLocation(), operands(), llvm::CallBase::populateBundleOperandInfos(), llvm::CatchSwitchInst::removeHandler(), llvm::PHINode::removeIncomingValue(), llvm::BitcodeReaderValueList::resolveConstantForwardRefs(), llvm::AAEvaluator::run(), llvm::SimplifyInstruction(), llvm::InnerLoopVectorizer::sinkScalarOperands(), SpeculativelyExecuteBB(), TypeSizeToSizeIndex(), value_op_begin(), llvm::sroa::AllocaSliceRewriter::visit(), and llvm::InstCombiner::visitGetElementPtrInst(). Definition at line 230 of file User.h. Definition at line 231 of file User.h. Referenced by alwaysAvailable(), llvm::RecurrenceDescriptor::areAllUsesIn(), llvm::SelectInst::areInvalidOperands(), buildMultiplyTree(), canFoldIVIncExpr(), llvm::objcarc::CanUse(), CC_MipsO32_FP64(), CloneInstructionInExitBlock(), llvm::ConstantFoldLoadFromConstPtr(), llvm::CallInst::CreateFree(), createReplacementInstr(), llvm::createSeparateConstOffsetFromGEPPass(), DominatesMergePoint(), doPromotion(), llvm::EmitGEPOffset(), ExposePointerBase(), llvm::FenceInst::FenceInst(), FoldCondBranchOnPHI(), llvm::FoldReturnIntoUncondBranch(), llvm::gep_type_end(), llvm::AllocaInst::getAllocationSizeInBits(), llvm::ConstantExpr::getAsInstruction(), getComparePred(), getDebugLocFromInstOrOperands(), llvm::SCEVExpander::getIVIncOperand(), llvm::InvokeInst::getLandingPadInst(), getMaxPointerSize(), getMetadataTypeOrder(), llvm::SelectionDAGBuilder::getValueImpl(), llvm::CatchSwitchInst::handler_end(), llvm::RecurrenceDescriptor::hasMultipleUsesOf(), hasUsesOutsideLoop(), llvm::GEPOperator::idx_end(), llvm::GetElementPtrInst::idx_end(), INITIALIZE_PASS(), llvm::Instruction::isIdenticalToWhenDefined(), llvm::gvn::AvailableValueInBlock::MaterializeAdjustedValue(), mayLoopAccessLocation(), operands(), llvm::CallBase::populateBundleOperandInfos(), llvm::CatchSwitchInst::removeHandler(), llvm::PHINode::removeIncomingValue(), llvm::BitcodeReaderValueList::resolveConstantForwardRefs(), llvm::AAEvaluator::run(), llvm::SimplifyInstruction(), llvm::InnerLoopVectorizer::sinkScalarOperands(), SpeculativelyExecuteBB(), TypeSizeToSizeIndex(), usesOperand(), value_op_end(), llvm::sroa::AllocaSliceRewriter::visit(), and llvm::InstCombiner::visitGetElementPtrInst(). Definition at line 234 of file User.h. Definition at line 261 of file User.h. References llvm::make_range(), value_op_begin(), and value_op_end(). Referenced by llvm::canConstantFoldCallTo(), collectHomogenousInstGraphLoopInvariants(), dependsOnLocalPhi(), findProfitablePHIs(), getScalarizationOverhead(), isNullOrUndef(), llvm::isSafeToExpandAt(), matchVectorSplittingReduction(), llvm::LoopVectorizationCostModel::memoryInstructionCanBeWidened(), okayForPHIOfOps(), operandReferences(), rematerializeLiveValues(), llvm::LoopVectorizationCostModel::setCostBasedWideningDecision(), and llvm::LazyCallGraph::visitReferences(). Definition at line 282 of file User.h. Definition at line 237 of file User.h. Referenced by AddReachableCodeToWorklist(), llvm::DivergenceAnalysis::addUniformOverride(), alwaysAvailable(), analyzeLoopUnrollCost(), appendSpeculatableOperands(), appendToUsedList(), BuildConstantFromSCEV(), callHasFloatingPointArgument(), callHasFP128Argument(), canEvaluateShuffled(), canFoldIVIncExpr(), canMoveAboveCall(), castRequiresQueuePtr(), llvm::TypeFinder::clear(), cloneInstructionWithNewAddressSpace(), llvm::LoopVectorizationCostModel::collectInstsToScalarize(), llvm::collectUsedGlobalVariables(), llvm::ConstantFoldInstruction(), llvm::ConstantFoldLoadFromConstPtr(), ConstHasGlobalValuePredicate(), contains(), createRdxShuffleMask(), DeleteTriviallyDeadInstructions(), dropAllReferences(), emitSignedInt64(), llvm::AsmPrinter::EmitSpecialLLVMGlobal(), llvm::InstCombiner::eraseInstFromFunction(), findArgumentCopyElisionCandidates(), findGlobalCtors(), findRefEdges(), forEachUser(), GetAnyNonZeroConstInt(), getComparePred(), getConstantEvolvingPHIOperands(), getMetadataTypeOrder(), getNarrowIntrinsic(), getNotRelocatableInstructions(), getOperandsExtensionCost(), llvm::slpvectorizer::BoUpSLP::getSpillCost(), llvm::AMDGPUTTIImpl::getUnrollingPreferences(), llvm::slpvectorizer::BoUpSLP::getVectorElementSize(), llvm::VPRecipeBuilder::handleReplication(), hasConcreteDefImpl(), llvm::Loop::hasLoopInvariantOperands(), hasPositiveOperands(), llvm::PHINode::incoming_values(), INITIALIZE_PASS(), llvm::SlotTracker::initializeIndexIfNeeded(), llvm::DivergenceAnalysis::inRegion(), instrumentMaskedLoadOrStore(), isBlockValidForExtraction(), isEphemeralValueOf(), isFuncOrArgAttr(), isOnlyReachableViaThisEdge(), isReferencingMDNode(), isSExtLoad(), isSimpleEnoughValueToCommitHelper(), isUnconditionalBranch(), llvm::Loop::makeLoopInvariant(), mapBinOpcode(), llvm::LoopInfo::movementPreservesLCSSAForm(), okayForPHIOfOps(), onlySingleValue(), orderValue(), parseGlobalCtors(), predictValueUseListOrder(), processHeaderPhiOperands(), processUDivOrURem(), llvm::RecursivelyDeleteTriviallyDeadInstructions(), llvm::DemandedBitsWrapperPass::releaseMemory(), RemoveDeadConstant(), llvm::InstCombiner::run(), llvm::LoopVectorizationCostModel::setCostBasedWideningDecision(), usesOperand(), llvm::InstCombiner::visitGetElementPtrInst(), and wrapConstantAsMetadata(). Definition at line 240 of file User.h. Free memory allocated for User and Use objects. Definition at line 165 of file User.cpp. References assert(), llvm::Value::HasDescriptor, llvm::Value::HasHungOffUses, llvm::Value::NumUserOperands, llvm::DescriptorInfo::SizeInBytes, and llvm::Use::zap(). Placement delete - required by std, called if the ctor throws. Definition at line 102 of file User.h. Definition at line 114 of file User.h. Allocate a User with an operand pointer co-allocated. This is used for subclasses which need to allocate a variable number of operands, ie, 'hung off uses'. Definition at line 149 of file User.cpp. References llvm::Value::HasDescriptor, llvm::Value::HasHungOffUses, and llvm::Value::NumUserOperands. Allocate a User with the operands co-allocated. This is used for subclasses which have a fixed number of operands. Definition at line 141 of file User.cpp. If DescBytes is non-zero then allocate an additional DescBytes bytes before the operands. These bytes can be accessed by calling getDescriptor. DescBytes needs to be divisible by sizeof(void *). The allocated descriptor, if any, is aligned to sizeof(void *) bytes. Definition at line 145 of file User.cpp. Definition at line 127 of file User.h. Replaces all references to the "From" definition with references to the "To" definition. Definition at line 20 of file User.cpp. References assert(), E, getNumOperands(), getOperand(), and setOperand(). Referenced by canonicalizeSaturatedAdd(), createRetBitCast(), llvm::DemoteRegToStack(), dropAllReferences(), llvm::CodeExtractor::findInputsOutputs(), llvm::CodeExtractor::findOrCreateBlockForHoisting(), LoopFuser::fuseLoops(), hasProfileData(), insertLifetimeMarkersSurroundingCall(), isAlwaysFoldable(), isBroadcastShuffle(), isIgnorableInst(), IsNonLocalValue(), isZeroLengthArray(), makeAllConstantUsesInstructions(), OptimizeGlobalAddressOfMalloc(), processMemAccess(), ReduceSwitchRange(), rematerializeLiveValues(), removeEmptyCleanup(), ReplaceUsesOfWith(), llvm::SplitIndirectBrCriticalEdges(), and llvm::slpvectorizer::BoUpSLP::vectorizeTree(). GlobalVariable always allocates space for a single operands, but doesn't always use it. FIXME: As that the number of operands is used to find the start of the allocated memory in operator delete, we need to always think we have 1 operand before delete. Definition at line 207 of file User.h. Referenced by llvm::GlobalVariable::operator delete(), and llvm::GlobalVariable::setInitializer(). Subclasses with hung off uses need to manage the operand count themselves. In these instances, the operand count isn't used to find the OperandList, so there's no issue in having the operand count change. Definition at line 215 of file User.h. References assert(), llvm::Value::HasHungOffUses, llvm::Value::NumUserOperands, and llvm::Value::NumUserOperandsBits. Referenced by llvm::SwitchInst::addCase(), llvm::LandingPadInst::addClause(), llvm::IndirectBrInst::addDestination(), llvm::CatchSwitchInst::addHandler(), llvm::PHINode::addIncoming(), llvm::LandingPadInst::Create(), llvm::CallBrInst::Create(), llvm::CmpInst::isImpliedFalseByMatchingCmp(), llvm::SwitchInst::removeCase(), llvm::IndirectBrInst::removeDestination(), llvm::CatchSwitchInst::removeHandler(), and llvm::PHINode::removeIncomingValue(). Definition at line 174 of file User.h. Referenced by BreakUpSubtract(), buildMultiplyTree(), canonicalizeSaturatedAdd(), CheckMACMemory(), cloneInstForMustTail(), llvm::InstCombiner::commonIDivTransforms(), llvm::InstCombiner::commonIRemTransforms(), llvm::InstCombiner::commonPointerCastTransforms(), llvm::InstCombiner::commonShiftTransforms(), llvm::RandomIRBuilder::connectToSink(), ConvertShiftToMul(), llvm::createScalarizerPass(), llvm::createSeparateConstOffsetFromGEPPass(), DCEInstruction(), deleteDeadInstruction(), llvm::JumpThreadingPass::DuplicateCondBranchOnPHIIntoPred(), llvm::DuplicateInstructionsInSplitBetween(), eliminateRecursiveTailCall(), foldCtpop(), foldCttzCtlz(), foldFabsWithFcmpZero(), foldICmpBitCast(), foldICmpWithMinMax(), llvm::FoldReturnIntoUncondBranch(), foldSelectBinOpIdentity(), foldShiftedShift(), foldXorToXor(), forceIndeterminateEdge(), llvm::BlockAddress::get(), getNarrowIntrinsic(), getShiftedValue(), INITIALIZE_PASS(), llvm::InlineFunction(), llvm::insertDebugValuesForPHIs(), isOnlyReachableViaThisEdge(), isSafeAndProfitableToSinkLoad(), LinearizeExprTree(), llvm::BlockAddress::lookup(), LowerNegateToMultiply(), MarkBlocksLiveIn(), mayUsePostIncMode(), mergeEmptyReturnBlocks(), NegateValue(), operator<<(), llvm::JumpThreadingPass::ProcessBranchOnXOR(), processUGT_ADDCST_ADD(), processUMulZExtIdiom(), llvm::remapInstruction(), replaceAllUsesOfWithIn(), llvm::VPValue::replaceAllUsesWith(), llvm::replaceDbgUsesWithUndef(), replaceGEPIdxWithZero(), replaceUsesOfWith(), rewriteDebugUsers(), RewriteUsesOfClonedInstructions(), llvm::LoopPredicationPass::run(), llvm::InnerLoopVectorizer::scalarizeInstruction(), llvm::IndirectBrInst::setAddress(), llvm::SwitchInst::setCondition(), llvm::SwitchInst::setDefaultDest(), llvm::PHINode::setIncomingValue(), llvm::GlobalIndirectSymbol::setIndirectSymbol(), llvm::CatchSwitchInst::setParentPad(), llvm::SwitchInst::setSuccessor(), llvm::IndirectBrInst::setSuccessor(), llvm::CatchSwitchInst::setSuccessor(), llvm::CatchSwitchInst::setUnwindDest(), llvm::SwitchInst::CaseHandle::setValue(), ShrinkDemandedConstant(), simplifyAllocaArraySize(), simplifyAndDCEInstruction(), simplifyAssocCastAssoc(), SimplifyBSwap(), llvm::InstCombiner::simplifyDivRemOfSelectWithZeroOp(), SimplifyIndirectBrOnSelect(), simplifyMaskedGather(), simplifyMaskedLoad(), simplifyValueKnownNonZero(), SpeculativelyExecuteBB(), llvm::JumpThreadingPass::ThreadEdge(), TryToSinkInstruction(), tryUnmergingGEPsAcrossIndirectBr(), TypeSizeToSizeIndex(), updateOperand(), llvm::sroa::AllocaSliceRewriter::visit(), llvm::InstCombiner::visitAdd(), llvm::InstCombiner::visitAllocaInst(), llvm::InstCombiner::visitAtomicRMWInst(), llvm::InstCombiner::visitExtractElementInst(), llvm::InstCombiner::visitFCmpInst(), llvm::InstCombiner::visitFDiv(), llvm::InstCombiner::visitGetElementPtrInst(), llvm::InstCombiner::visitLoadInst(), llvm::InstCombiner::visitReturnInst(), llvm::InstCombiner::visitShuffleVectorInst(), llvm::InstCombiner::visitSRem(), llvm::InstCombiner::visitStoreInst(), and llvm::InstCombiner::visitXor(). Definition at line 255 of file User.h. Referenced by llvm::EliminateDuplicatePHINodes(), llvm::InnerLoopVectorizer::fixupIVUsers(), llvm::TargetTransformInfoImplCRTPBase< AMDGPUTTIImpl >::getInstructionLatency(), llvm::DenseMapInfo< CallValue >::getTombstoneKey(), llvm::TargetTransformInfo::getUserCost(), markAliveBlocks(), matchSelectWithOptionalNotCond(), operand_values(), llvm::BranchInst::successors(), and llvm::IndirectBrInst::successors(). Definition at line 276 of file User.h. Definition at line 258 of file User.h. Definition at line 279 of file User.h. Definition at line 46 of file User.h.